The STONE family in coming to Australia was to select a preferred destination on one view they could have done no better than Queensland - a hundred years later in time, that is. There wasn't much infrastructure in that part of Australia in the mid 1860's and great hardships awaited those who arrived to travel inland to work on the railway linking the west with Brisbane. The harshest of conditions awaited the new immigrant workers. 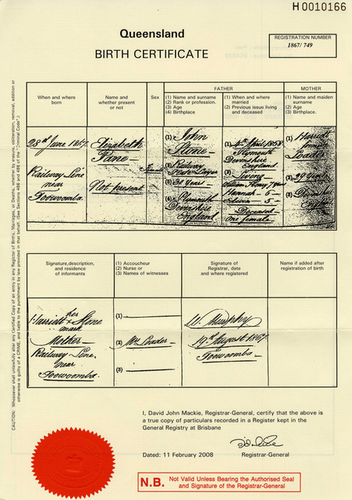 A birth certificate that describes a birth as beside 'railway line near Toowoomba' is a sober reminder of what it was to be a pioneer in the early stage of Queensland's development. Queensland is one of Australia’s most prosperous and desirable locations. We celebrated our sesquicentenary (150 years) in 2009. New South Wales had been settled as a Penal Colony following the loss of the North American Crown Colonies in the War of Independence. The British Government had been forced to look elsewhere to send their convicts and South Africa and Australia were the best options. South Africa was the preferred destination but unprepared whereas Australia further away (a benefit in itself according to some in Whitehall) was up and running as established penal settlements from Norfolk Island to Tasmania. Previously Captain Cook1 had charted the coast of East Australia in 1770 including Queensland. The First Fleet arrived in Botany Bay 1788 and so commenced the British claim of colonization of a continent that was to become Australia and certain of the Pacific Islands. Graphic of the three voyages of James Cook including the discovery of the east coast of Australia. Brisbane assumed an important role as an urban hub for those settlements and pastoral interests far from Sydney. It became the dominant urban area north of Sydney and was linked by sea to London and other ports. Predictably over time as the population expanded and commerce grew the people of Brisbane sought to have a greater say in their own development rather than be dictated to by Sydney. That sentiment persists to this day. As a result of this agitation a public meeting was called in 1851 but it was to take another 8 years before the British Government was of like mind. On 6 June 1859 Queen Victoria approved the establishment of the new Colony of Queensland becoming a self-governing colony with its own Governor, Constitution, and a nominated Legislative Council and elected Legislative Assembly . The first Governor of Queensland was George Ferguson BOWEN . He officially proclaimed Queensland as a separate colony from New South Wales on 10 December 1859. Queenslanders mark June 6 as the States birthday. New towns and settlements quickly sprang up in Queensland. By 1860 Rockhampton and Ipswich had been declared towns, the following year Warwick and Maryborough. Queensland held the first elections for the Legislative Assembly in 1860 and Robert George Wyndam HERBERT became the first Premier. On 22 May 1860 the first Queensland Parliament opened and immigration, development and transport were top of the inaugural Government’s agenda. Rail became an important means of communication in the new Colony. Gradually the rail network expanded. 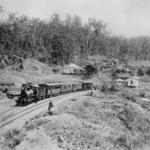 The first line opened in 1865 between Ipswich to Grandchester in the foothills of the Darling Downs. 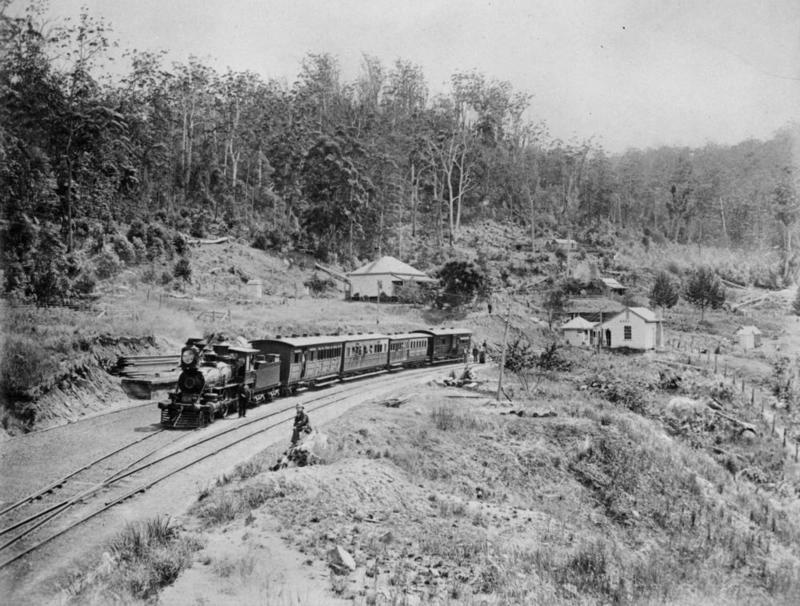 The line was extended to Toowoomba in 1867 and from Ipswich to Brisbane in 1875. One of the overriding priorities of the new Government was to increase the Queensland population. Queensland representatives and agents were very active in the United Kingdom early on. In a three year period over 25,000 new settlers arrived, many attracted by offer of work and a new land order scheme that offered the prospect of ownership. Against this background the STONE family arrived in Queensland. 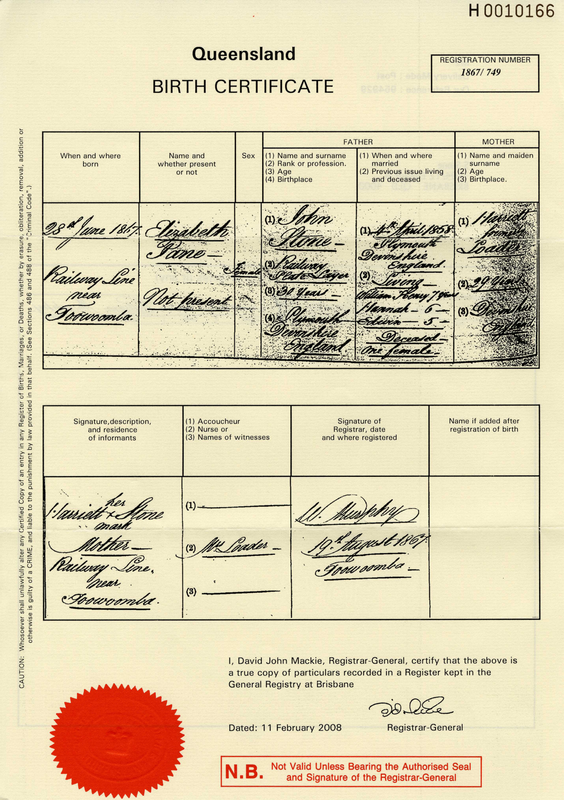 From what we know the STONE’s had an early association with three Queensland settlements – Brisbane, the point of entry; next Toowoomba their place of employment and birth in 1867 of the first of their Australian children Elizabeth Anne STONE (declared a municipality in 1860 and a town in 1892). The second of their Australian children Harriet STONE was born in 1868 at Dalby (incorporated into Queensland in 1859 and declared a municipality in 1863) on the Darling Downs. One could not have imagined a greater contrast with the South Hams in topography and climate.